Hi Greg, its Rory the carpenter. Thank you for a truly inspirational evening last night at Groote Schuur. Thank you again , my little family have faced huge challenges in the past, and sometimes one feels like the world is pressing down on one and it takes all you have to get up, dust yourself off and keep on. Last night gave Dhilshad and I the inspiration and knowledge that no matter how big the challenge, there are others facing problems that cause our own to pale into insignificance. As I intimated last night I am eager to volunteer in your boat refurbishing project. I may not have worked on any kind of vessel, but I have worked with marine ply, fibreglass and other media which with a little research I am sure I can apply to your project. Because of last night I have started looking into building myself a little “big optimist” in which I hope to learn the art of sailing, and who knows, perhaps one day in the not too distant future there may be a little fleet of little boats retracing your incredible journey… If it ever happened I certainly would love to be in one of those little boats. What an event! Knysna Yacht Club really showed some support this past week and we were super thrilled to be here! Thanks Greg & The Little Optimist for one of the best motivational evenings I’ve ever attended. I had no idea what to expect – I only knew the bare minimum of your story and the work you carry out on behalf of your beneficiaries. I left feeling inspired and motivated to make some positive changes in my life and to share your story with my family and friends to inspire them to do the same. Your attitude is refreshing, your presenting style is passionate and I loved every minute of the evening. I just wanted to say that I loved you talk yesterday! It was really inspirational. I didn’t realise that you had been through your heart surgery twice – very traumatic. Ironically, with all my family cancer etc I also ended up with Dr Nick Schalopbersky. He sent me on a mindfulness and meditation course which changed my life. Ironic! Anyhow, amazing stuff you’re doing – you must be so proud…..
“An evening of comeraderie and inspiration . Always great to spend time with Club members and partners at a “cosy” gathering with a “best ever” speaker relating his inspirational challenges he has overcome and children related projects he is tackling . Many thanks for your most inspirational speech yesterday. There were so many of our members who came personally to tell me how much they had enjoyed your talk. You have such an amazing ability to reach out to all ages. Quite a few of them also asked whether we can let them know when your dvd and your children’s books are available. Would you be able to let me know and I can contact them all? Here is a link to the NSRI website where there are a few photos and a short report. Again, my sincere thanks for your support. Greg Bertish – a big wave surfer and former South African Stand UP Paddle Board and South African Surf Lifesaving Champion – holds the Red Cross Children’s Hospital close to his heart. The 46-year-old dad, who has undergone two open heart surgeries, can still relate to the need for a little bit of optimism and a dose of inspiration when it comes to recovering from a life-threatening stay in hospital. It’s because of this that Bertish decided to support the Hospital a few years ago and most recently, has embarked on a passionate plea to the public , using social media to rally together support for his “Let’s paint the Hospital project.” The response was overwhelming with thousands of members of the public coming forward to pledge their dedication in giving the Red Cross Children’s Hospital a fresh lick of paint. Although the Western Cape government regularly maintains the Hospital, this community-driven initiative is the most fitting 60th anniversary gift, ensuring that the thousands of patients who are treated at this world-class Hospital each year have an even more homely and appealing place to stay. The project will be implemented in early 2017. Funds raised through the Children’s Hospital Trust will go towards purchasing the paint as well as the professional services needed for the project. Earlier in 2016, Bertish raised over R250 000 for the new paediatric Intensive Care Unit (ICU) at the Red Cross Children’s Hospital. 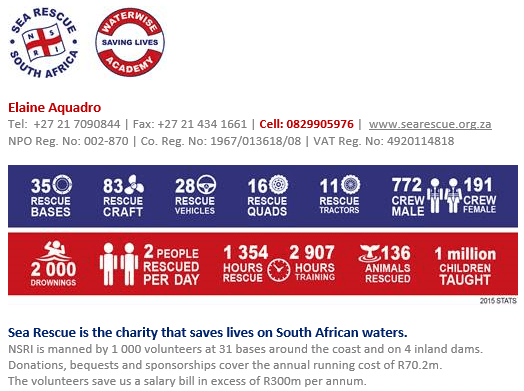 Subject: Milnerton Aquatic Club – Thank You ! First of all – apologies for the delay in thanking you for your amazing ‘presentation’ at our opening cruise. This was no presentation as I say, but a real life story that needs to be told. I cannot emphasize how much interest and energy you imparted on our Members that day and we as a collective at the Club thank you immensely. Looking forward to seeing you on the water – happy sailing, surfing and paddling ! Thank you so much for coming to speak at the breakfast meeting today. It may not have been your typical audience but it clearly touched them all deeply. You are an incredible speaker, so human and compassionate and humble. We had rave reviews from all our guests. Today came across your website and – what a surprise! First the storyline caught my eye, and as i read further..i remembered. I am truly pleased to read that you are well and getting “your life back”..different, more intensive, more aware and most off all..very appreciative of the little things it has to offer (all those things which we think are..normal, compulsory…yep..they really aren’t). Your site is now in my “favorites” folder and i shall not hesitate to recommend it further. Enjoy your life, family and friends…and even the little caterpillar…he might be a beautiful butterfly one day. A huge thank you to you and your wife for being there last night,your talk WOW’ed so many people! Lots came to mention it to me and thought you were so inspiring and amazing!